Bathrooms can be a nightmare to renovate. There's so much that could go wrong and end up costing a lot of money. However, there are ways to make a bathroom more appealing without needing to demo or change the layout. These DIY bathroom decor ideas and simple makeover projects will help you make the most of your space in as little as a couple hours. Continue to 2 of 32 below. Who says toilet paper has to be boring? Upgrade your toilet paper holder by making one of your own that is a bit more contemporary. Make the entire project a conversation piece by investing in some funky paper, perhaps in a guest bath that isn't used as often. Continue to 3 of 32 below. Macrame projects are trending right now, but we don't expect them to go out of fashion any time soon. 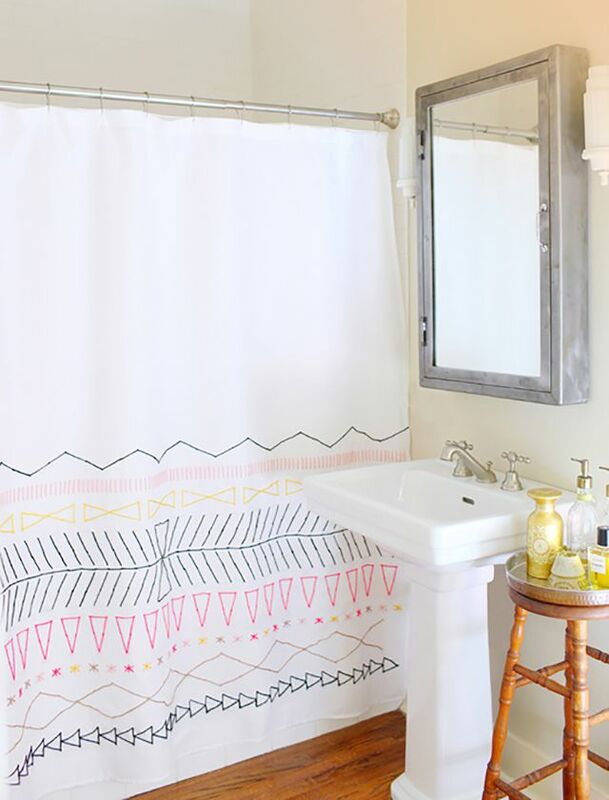 This shower curtain project is whimsical, romantic, and will add a custom touch to your bathroom without a ton of effort. Continue to 4 of 32 below. Tissues are bathroom essentials that usually stay in their unattractive cardboard boxes. To make the tissues seem more like a piece of bathroom decor, invest around $3 and use some Birch plywood to make a more permanent tissue box. You can either stain or paint the wood or leave it natural. Using woods like cedar and bamboo in the bathroom will instantly make your space feel more like a spa. Consider making this cedar bath mat if you want to feel like your stepping in and out of a sauna everytime you take a shower. Continue to 6 of 32 below. Bathroom shelving is an integral way to keep bathroom essentials on hand. It's also a great place to practice your shelf styling skills. This project is especially fun because it inverts the way the shelf brackets are hung and creates shelving that is much more interesting. Continue to 7 of 32 below. When the bathroom is small, every square inch of shelf space is important. Add an extra surface for bathroom decor and essentials by utilizing the space above your toilet paper. All you need to complete this project is some scrap wood and a toilet paper holder. Continue to 8 of 32 below. If your bathroom has a standalone tub, make it more of an experience by adding a reclaimed wood bath caddy into the mix. Be sure to stage the caddy with everything you would need to have the most relaxing soak in your tub. Include candles, a book, luxurious soaps, and perhaps a glass of wine. If you want to create a coastal inspired bathroom, this project will add just the right amount of shine and color while saving you money in the process. Take some time to pick out a mosaic tile that will be easy to work with and will complement the space. Continue to 10 of 32 below. This shelving project has a bohemian and coastal feel and would work well with both design aesthetics. The rope has a very nautical feel and so do the wall hooks that look like mini dock cleats. Make sure to anchor the shelves to the wall and not depend entirely on the rope for shelving stability. Continue to 11 of 32 below. This charming bathroom door sign is a clever way to show guests where the bathroom is without needing to offer explicit directions. Want to make this project even less expensive? Pick up an inexpensive hanging sign from the Dollar Store and paint over it. Continue to 12 of 32 below. The best-styled bathrooms always have nice looking toiletries in uniform containers. Expensive products tend to have better packaging that looks appealing. But what about if your favorite shampoo is only a couple bucks and the bottle isn't attractive? Create your own containers in pretty amber bottles to get a high-end look. If you're tight on space in your bathroom, you might understand the struggle of not having enough storage for toilet paper inside the bathroom. Always keep a couple extra rolls on hand inside the bathroom and solve the storage problem by creating an attractive solution that you can leave out on the floor or on a shelf. Continue to 14 of 32 below. If you have a large bathroom cabinet that also doubles as a vanity, consider building a tray to house some personal items. Most people have a tendency to stash items on top of their vanity with little thought behind it. Using a tray makes the space appear less cluttered and more styled. Continue to 15 of 32 below. If you're having a hard time finding a unique shower curtain to fit in with your bathroom, consider making your own. Though this DIY bathroom decor might take longer than some of the other projects, the results are totally worth it. Continue to 16 of 32 below. Sometimes bathroom decor can be quite literal, like this sign that reminds people to flush after using the toilet. Your sign could say anything bathroom related like "wash" or "brush" instead. Builder grade bathroom mirrors are boring and leave little to the imagination. Add some character to any bathroom mirror by framing it out in some reclaimed wood. If your style is more modern, use sleek white trim instead. The thicker you can make the frame, the better. Continue to 18 of 32 below. Add some character to a bathroom by framing a claw foot tub with a reclaimed wood valance. If you have a tub and shower combo, position the valance in front of the shower curtain to infuse some farmhouse style into the room. Continue to 19 of 32 below. Here is another shower curtain project that is so simple to make yet such an upgrade from many of the shower curtains on the market. Find a thick ribbon that is in keeping with your style. In this case, they opted for a Greek key design. Adhere the ribbon to the edges and opt for two curtains to make them feel more luxurious. Continue to 20 of 32 below. One of the simplest and most inexpensive ways to completely change the look of your bathroom is to paint your bathroom cabinet. Take the time to learn how to do it right or else you risk the cabinet looking worse than when you started. Struggling with old laminate countertops in your bathroom? Learn how to hide stained, chipped, or ugly bathroom countertops with a coat of paint that will leave them glossy and durable. Continue to 22 of 32 below. When you decide to create your own hand soap, all the creative control is in your hands. You can choose the fragrance, bottle, and label. This project is such an attractive option to follow from start to finish and will certainly add some sophistication to your bathroom. Continue to 23 of 32 below. Using ladders for towel storage has become very popular in recent years, but what do you do if you don't have any extra floor space for a ladder? Build one that can hang on the wall. This project combines ladders and hanging shelves, which are both in keeping with current bathroom design trends. Continue to 24 of 32 below. When there's no medicine cabinet in a bathroom, storage solutions for small items can be difficult. Old windows are easy to find and pretty inexpensive. With a little patience, an old window can undergo a complete transformation to become one of the most functional pieces in a bathroom. If you want to give your bathroom the look that it's just been renovated without the reno, try this process first. Adding some wood panels can make even the dingiest tub feel like a custom built in. Continue to 26 of 32 below. This sunrise mirror is a clever way to add more surface area when space is limited and there's no room for a medicine cabinet. It also adds a ton of visual interest to an otherwise boring mirror. When hanging the shelf, be sure the placement isn't too high to cut into your sight line. Keep your toothbrushes on the shelf or keep the shelf clean with a plant or two. Continue to 27 of 32 below. There are a ton of towel racks on the market, but none will be as one-of-a-kind as the one you can make yourself. Don't feel the need to match hooks. For a more eclectic look, use a variety of hook styles on reclaimed wood. Continue to 28 of 32 below. Head to the thrift store and pick up the most used, worn out sauce pot you can find. Next, grab some sisal strand rope and get wrapping. You'll be amazed at the transformation. To use this basket in a bathroom, roll up some washcloths or store items like toilet paper inside. If you buy your handsoap in bulk, it makes the most sense to have a glass soap dispenser that is much easier to clean and refill than the plastic ones the soap comes in. Mason jars are durable enough for the task and will add some farmhouse style to your bathroom as well. Continue to 30 of 32 below. Bathroom vanities and cabinets are one of the more expensive fixtures in a bathroom. It can get discouraging shopping for one and realizing that anything worthwhile will cost you a small fortune. Stop shopping and instead start searching for plans to build your own for much less. Continue to 31 of 32 below. You don't have to be stuck with an ugly bathroom light fixture. In fact, this transformation is almost too good to believe but is completely attainable. This makeover uses paint and new Edison style bulbs to completely change the look of a builder grade light fixture. Continue to 32 of 32 below. Many of these DIY bathroom decor ideas focused on things we see and use, but what about our sense of smell? Bathrooms are breeding grounds for offensive odors so it's important to keep them in check with regular cleanings and perhaps a candle or two. Pick a scent that is relaxing for the evening and use energizing scents throughout the day.